Wow, the light displays in the southwest suburbs are amazing. We drove around for hours and have not been able to make it to all of them yet, but we were blown away! 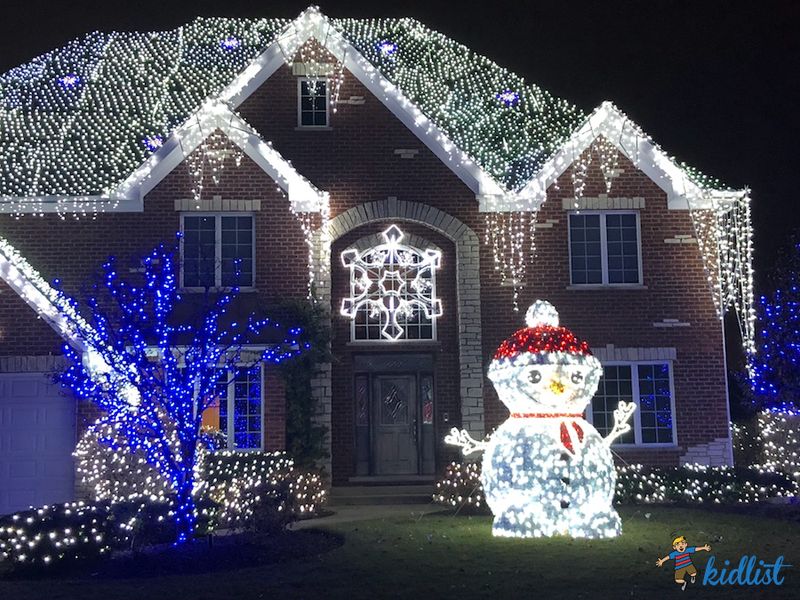 Pack up your family, throw some blankets over the kids, grab a hot chocolate, and use this guide to check out the best Christmas lights in the southwest suburbs! You can use our handy map to plan your route and answer the question “Where are the best Christmas lights near me?”. Please note: The houses noted with an asterisk were verified in 2017. While many families do displays yearly, some may be taking a year off, have moved, etc. We wanted to get the list out early so you could scope out all the lights ASAP, but we’re still collecting submissions for 2018! If you know of a great light display (or have one yourself!) please comment below or email Annie at annie@mykidlist.com, and we’ll check it out. 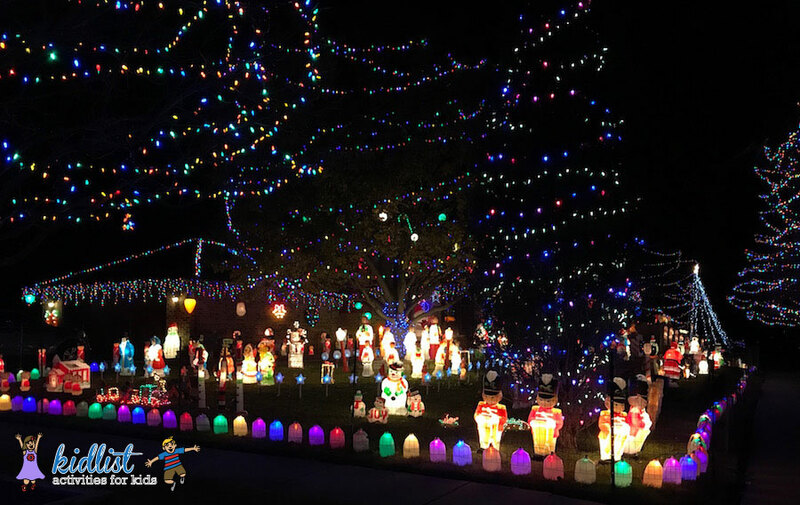 Are you trying to search for “the best Christmas lights near me”? This map is the answer to your question. Simply enter your zip code or address, then search and the map will generate a list within the radius you selected. Enjoy! 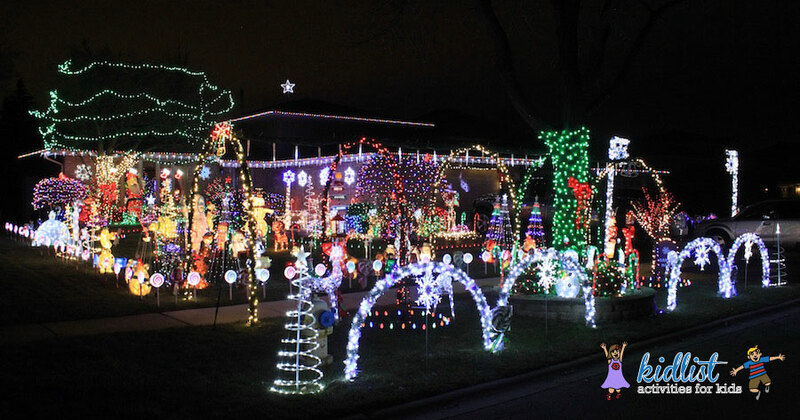 Click here if you are looking for the best Christmas lights in the western suburbs. Reminder: The houses noted with an asterisk were verified in 2017. While many families do displays yearly, some may be taking a year off, have moved, etc. You can see these lights from 355 and they are even more magnificent up close! photo courtesy of the homeowner, Scott O’Connor Jr.
Wow. Check out this decked out front lawn! Also, all surfaces of the houses and roofs are covered with lights! The lights are on 5:00 – 10:00 pm daily. You will want to park and get out of your car for this one. The Kowalczyk home is decorated to the hilt with so many lights and decorations that I needed to include more than one photo. Scenes from Disney’s Frozen, a gingerbread house, an enormous (maybe 20 feet tall?) 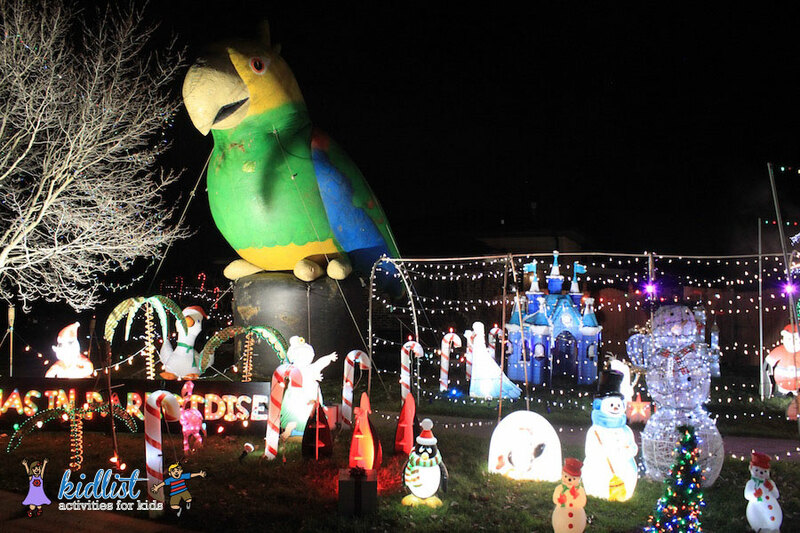 inflatable parrot, moving Santa figure, arches to walk through, lights over the driveway… the display is truly amazing. Tune your radio to 98.9FM to get the full show while you watch amazing lights. Unfortunately, the lights weren’t on when we went so I couldn’t get a photo, but there are a plethora of lawn decorations and dolls in the windows! 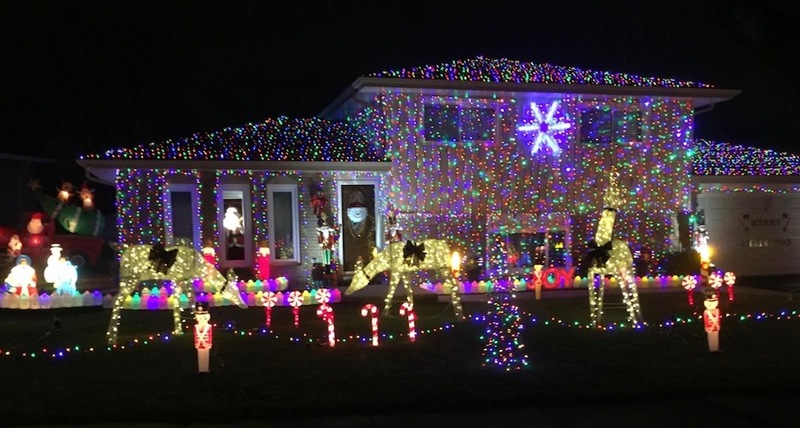 Also known as Santa Claus of Tinley Park, this house is unbelievable! They even have a clear garage door with more decorations and mechanical figures. Santa will be on the sleigh in the driveway from mid-December until a day or two before Christmas. They turn on the display when all of the decorations are completely done, which hasn’t happened yet, but the homeowners told me it will be roughly the first week in December. Check their Facebook page for updates. 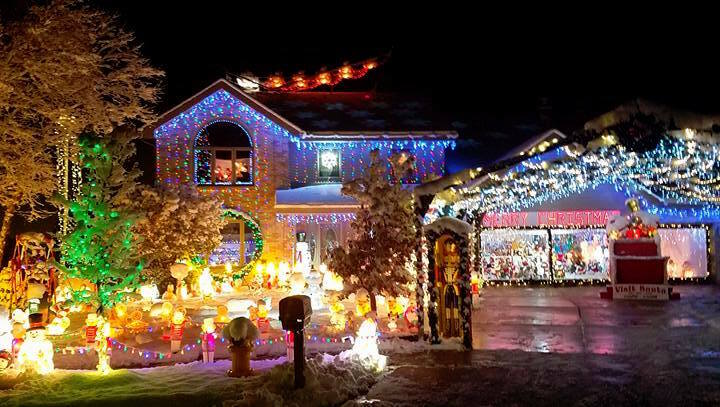 There is tons to look at and enjoy at this lights display. Pull over and enjoy the layers of lights, figurines, and decorations! Many scenes with Mickey Mouse, figures of the nativity, snowmen, Santa, carolers, penguins and more. Inflatables and colorful lights everywhere you look. A Christmas minion will be waiting to greet you as snowflakes and icicles cascade down the front of the house. Look at the front window and you might just catch a glimpse of Santa. The display is best seen lit up after sunset through midnight from now through January 6th, 2019. Tune to 92.9 FM to enjoy this display, which benefits Watts of Love. These festive lights are nicely done and worth driving by. 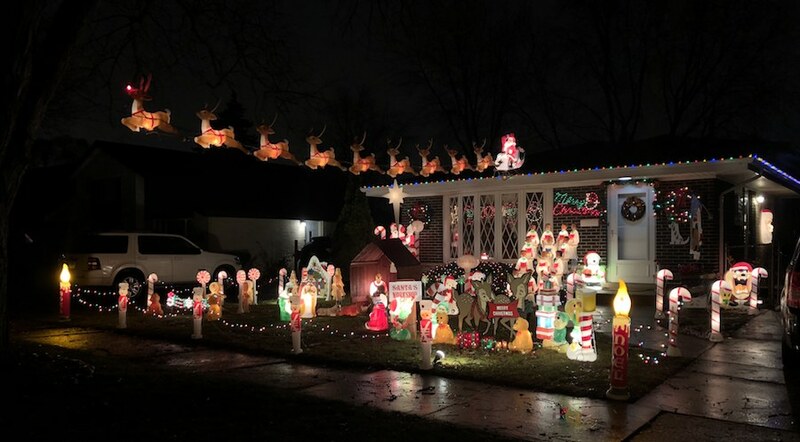 The reindeer suspended from the roof are impressive! There are two beautiful tunnels at this house… one over the driveway and another across the front yard that make this display magical. Moving displays and an elf cutout for a fun photo opportunity. 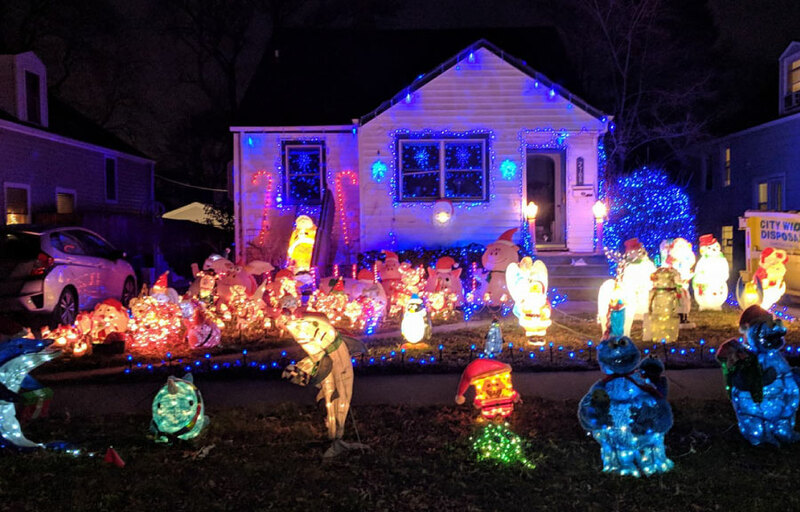 At first glance you might miss the awesomeness of this house since the lawn ornaments don’t crate the bling that others might, but the windows are filled with animatronic dolls, Disney characters, including Mickey Mouse, Winnie the Pooh, and Peanuts characters. They are amazing. These decorated houses are right next to each other, which adds to the wow factor. You will see a combination of laser projections, lights, and lit up inflatables. 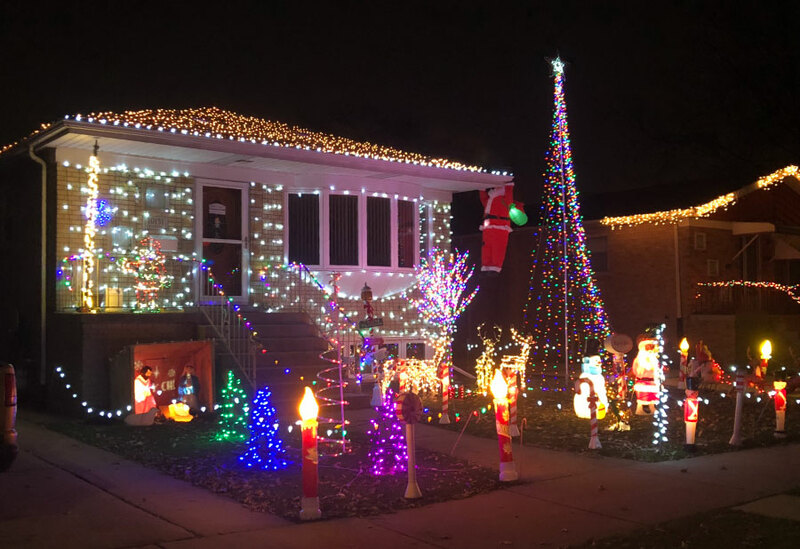 Turn off 167th Street onto Patricia Avenue and roll down your windows to hear the Christmas music playing while you enjoy the lights. This one is a little harder to see because it’s on 167th Street, but you can turn on Gaynelle Road and pull over to check it out. If you are driving through the neighborhood, this is a nice one to pass by to get in the holiday spirit. The photo doesn’t do it justice because it’s all timed to music. Tune in to 90.3 FM and watch the show! Show hours: Sunday through Thursday, 5:30 – 9:00 pm, Friday and Saturday, 5:30 – 10:00 pm. Even more lights are still being added, but this one is beautiful. We haven’t been able to photograph this one yet, but it’s a big one! If you have a photograph, we would be happy to credit you. The milk carton lights are a nice addition to this corner lot and there is plenty to see, including a light train, choir, soldiers, and other scenes. Great property filled with lights! Your kids will enjoy all the snowmen, soldiers, inflatables, and more! Eric’s comments: “There are lights all around the front and back. You can see the house from 143rd, there is so much.” Thanks Eric! Lots of lights and decorations, including a 23 foot tall blow up Christmas arch, lots of Christmas characters and the entire house covered with 40,000 lights. 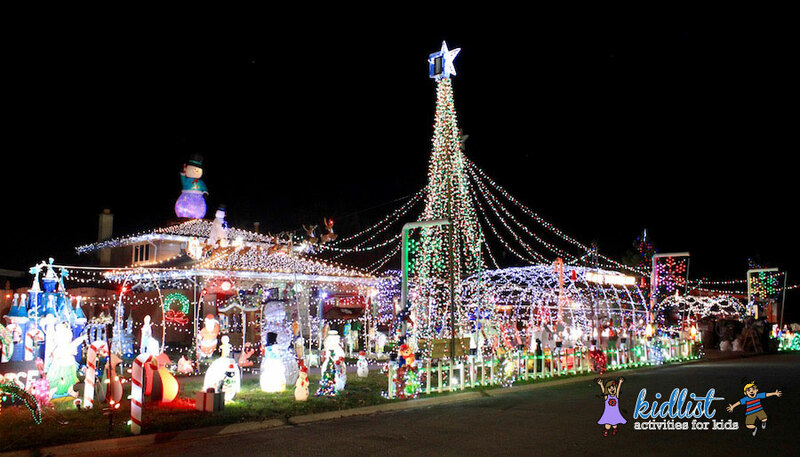 A plethora of lit up lawn ornaments, the majority of which are illuminated holiday pigs and other animals! Plenty to look at and get in the holiday spirit. 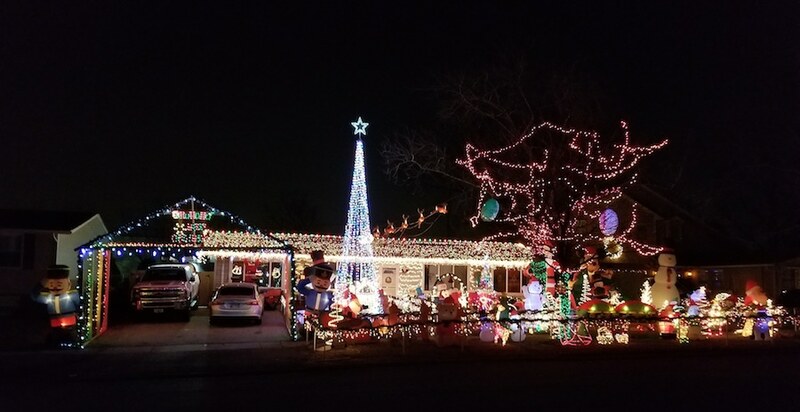 photo courtesy of homeowner, Bob S.
A sign in front lets you know what radio station to tune into to see the lights synchronized to music! Mechanical ferris wheel and many lit up lawn ornaments. Right off of Flossmoor Road and the houses just across Flossmoor Road to the north also join in. 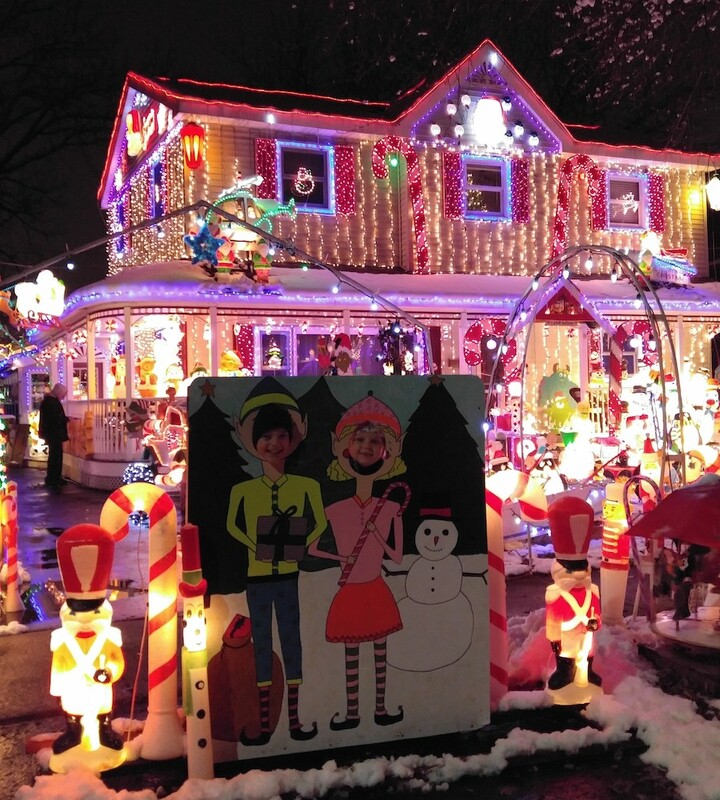 For more holiday magic, check out all the Best Christmas Lights in the Western Suburbs! And check back for more updates on 2018’s displays. 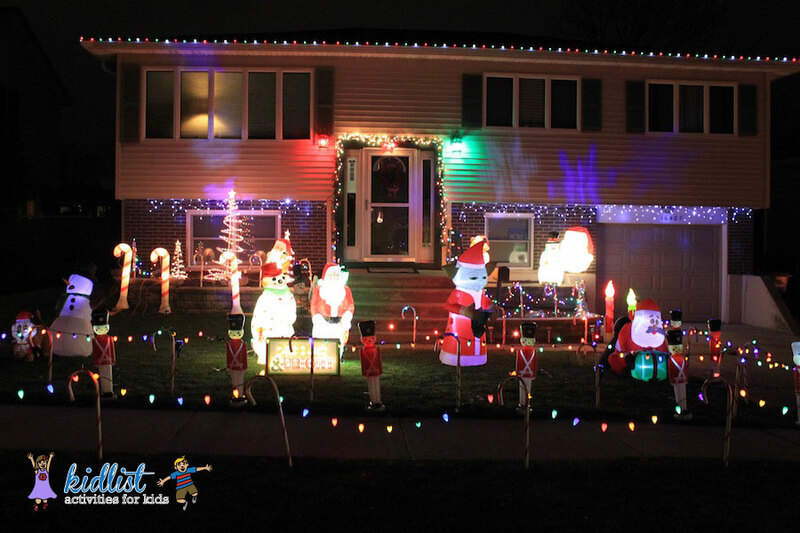 If you know of a great light display, leave a comment below or email annie@mykidlist.com. 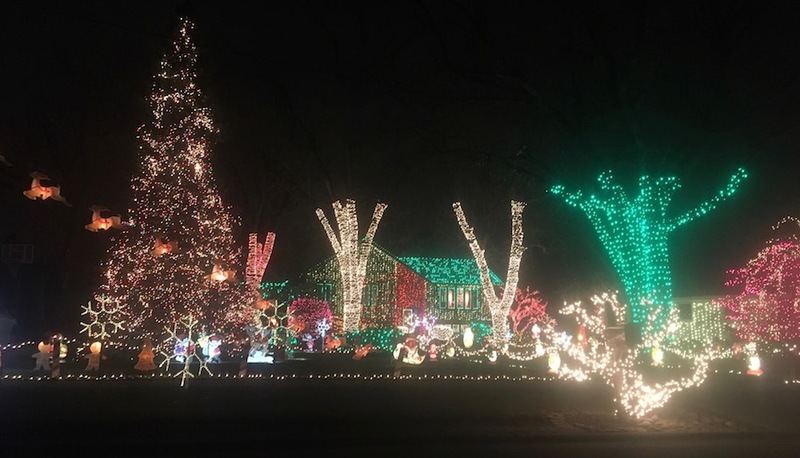 7 Comments on "Best Christmas Lights in the Southwest Suburbs"
There are several incredible homes in Naperville (located near Rt 59, south of 75th street), complete with a light show coordinated to music on the radio. We did a Trolly Tour last year & saw several amazing homes & neighborhoods! There are houses on 152nd and Ventura St. in Oak Forest that have some amazing Christmas displays. Don’t bother with the display at 85th Place in Burbank. It isn’t good and the wife has a history of harassing minors. Definitely go check out the house on 14601 poplar they don’t have it lit yet but when it is finally lit they have a lot of stuff to see. I have a Christmas display I want to have on the list. The address is 15232 Ventura St. Oak Forest, IL 60452. The lights go on at 6:30 until 10:00 pm during the week and 6:60 pm til ?? on the weekends. Thank you.